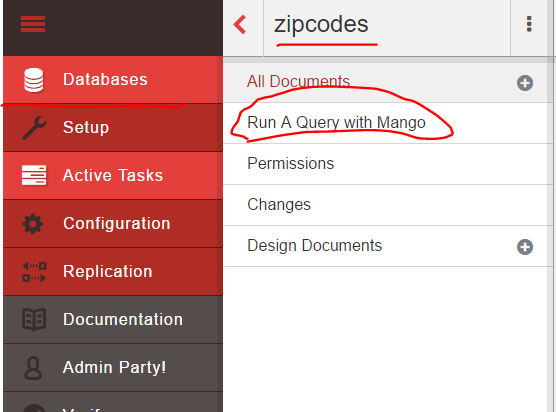 In the previous post we started discussing a new feature in CouchDB 2.0, namely Mango queries. 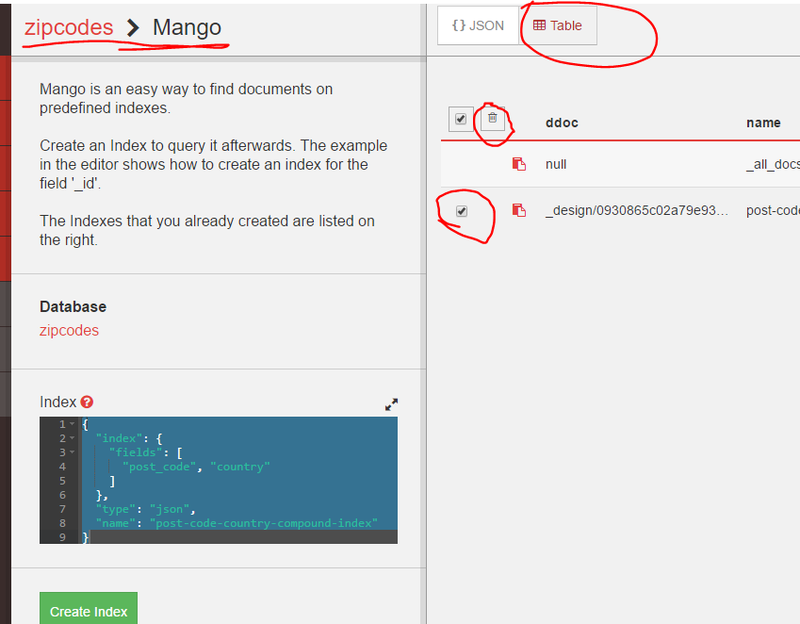 Mango queries and Mango indexes are also based on views but these views are created for us, we don’t need to worry about them. 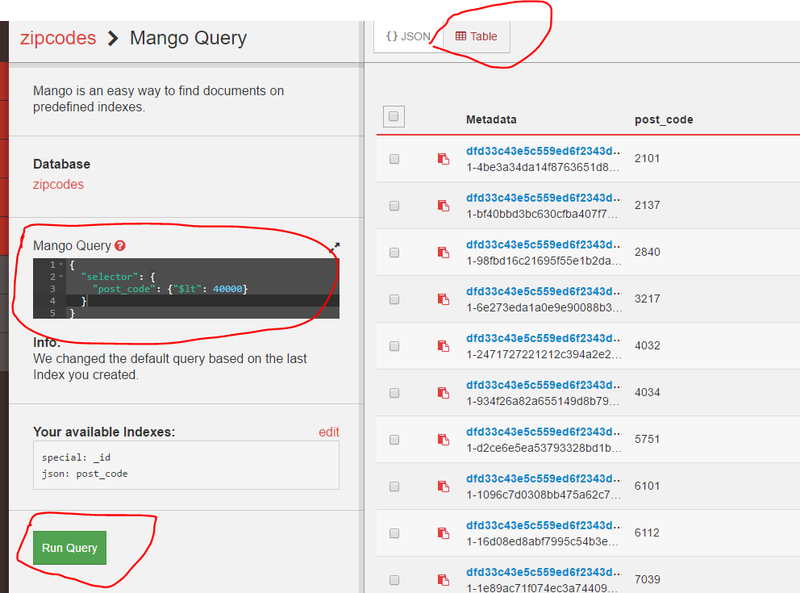 Therefore Mango queries provide us with a tool to perform ad-hoc searches in CouchDB with a JSON-based query language. 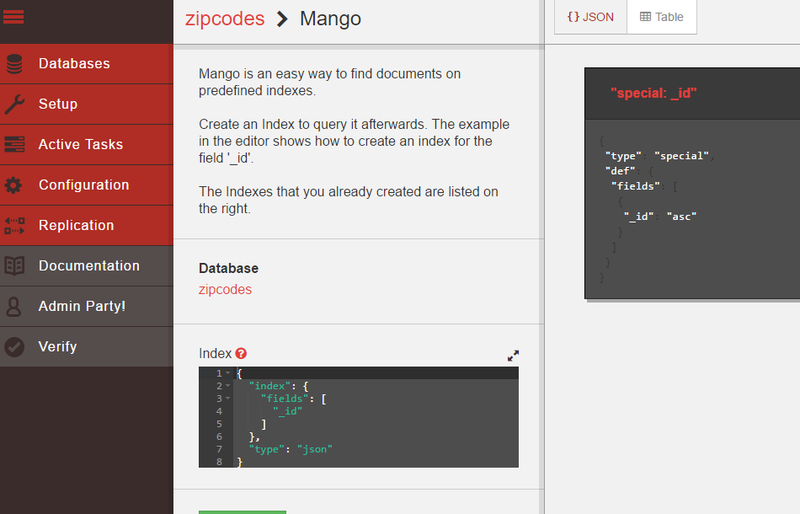 We spent most of the previous post on setting up a small database of ZIP codes that we use for our demos. The gateway to performing the queries is the POST /_find endpoint in the HTTP API. We attach the query to the HTTP request body. We looked at the various properties of the query where the selector is the most important. We also saw that the _id property is indexed by default and then carried out our first query based on the id. In this post we’ll continue looking at Mango queries. The selector condition is itself a JSON object with the operator and its value. Operators and their values come in pairs like that. That’s right, we have no index on the post code field yet. However, the query still could be executed which is very positive. We’re used to this behaviour from other popular database engines, that queries with no matching indexes are also allowed through. …and press the green Create Index button. If you look at the “def” column then you’ll see that an index has an extra property value “asc”. It means ascending of course. Indexes can be ascending or descending, with ascending being more common. The index will keep the indexed field in ascending or descending order depending on how the index was specified. We’ll execute the same query as above once again in a bit and you’ll notice that the results are sorted in ascending order by the post_code field automatically. This ordering will make searches very efficient. We discussed before that view indexes must be refreshed if a new document is inserted into the database. That’s quite common for indexing in general: indexes must be updated when the underlying data changes and CouchDB is no exception. If there’s a new ZIP code document then this ZIP code must be squeezed into the ZIP code index. This implies that write operations are slower compared to the situation with no indexes at all. However, reads will be much faster. You’ll need to consider the frequency of reads and writes before you blindly start creating indexes on every single field. This latter strategy is never a good idea by the way. Normally read operations by far outweigh writes in an application which is an extra ingredient in the index planning process. Furthermore you’ll notice that the “fields” property has an array as its value. It’s because we can insert compound indexes, i.e. indexes that consist of 2 ore more fields. If there’s a frequent search on two fields, e.g. post_code AND country then it can be a good idea to create a composite index of “post_code” and “country”. That kind of index will also help with searches on the post_code field alone. However, if there’s a search solely on the country field then the multi-key index won’t be usable as the primary sorting key is the post_code. Country is only the secondary sorting key in that case and a country-based query will need to go through all documents. This feature may be implemented in the future though. You can execute the demo queries via Fauxton or the HTTP API as you wish. Some bits and pieces look different to what we saw before regarding views but the index called post-code-index is definitely a view. It has a map and a reduce phase as well. We need only the top 5 elements after skipping two. These two are often used for paging through the results. …which doesn’t bring us anything new since we only have a single country in the database. However, you see how the “sort” property is an array that can be extended. We’ll continue with selectors in the next post.